Originally a visiting volunteer at her local Children’s Hospital with her previous cocker, Muppet, she joined the board of Trustees in April 2018. 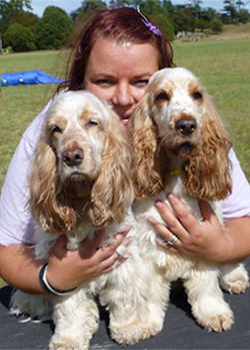 Leisl actively recruits new assessors for the Charity and has been part of the working committee to implement the Kennel Club’s Bark & Read Standards of Practice. When Leisl is not working full time, she can usually be found fishing ‘Krumble’ and ‘Tassel’ out of a muddy puddle somewhere!